Characters in a story have many roles and purposes, all of them dictated by the writer's intent and style. The protagonist is the main character in a story, novel, drama, or other literary work. He or she is usually a character that the reader or audience empathizes with, or at least cheers for, whether it's rooting for that person's success or demise. More importantly, however, this character acts as a catalyst to the story's plot by making or causing an action that moves things along. Without a protagonist, literally nothing happens. The term "protagonist" comes from ancient Greek and roughly translates to "one who plays the first part." Ancient Greek playwrights such as Thespis, Aeschylus, and Sophocles all incorporated protagonists, as Greek plays evolved from having mainly static Greek choruses to featuring complex plots and characters with different dramatic purposes. In many stories, the reader experiences the tale through the protagonist's eyes. But in some instances, the story is revealed through several characters who describe their perspectives to the reader or the audience. The protagonist's nature and moral fiber can also vary. The protagonist may be an anti-hero or another character whom the reader or audience dislikes. The protagonist should not be confused with another important lead character in a story, the antagonist, who opposes the protagonist. In the most archetypical of narratives, this dynamic boils down to bad guy versus good guy. A prime example in modern-day cinema is ​good-guy Luke Skywalker going head to head with bad guy Darth Vader in the "Star Wars" movies. However, one also could make the argument that two other characters in the "Star Wars" universe could be considered protagonists: Princess Leia and Han Solo. After all, if not for Leia sending a coded message to Obi-Wan Kenobi, Luke would likely have remained a farmer on Tattooine. And if not for Han Solo's ship the Millennium Falcon, Luke and Obi-Wan would not have gotten very far. 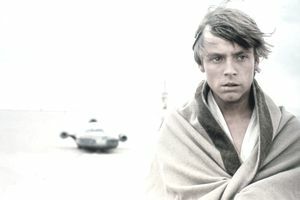 But since the story is told primarily from Luke's point of view, he's probably the strongest example of a protagonist in the original "Star Wars" trilogy. Usually, the audience sees the action through the protagonist's eyes. In movies as well as in works of literature, the protagonist may be hard to identify, especially if you're looking for a heroic character. Becky Sharpe is one of the main protagonists in "Vanity Fair," but she's extremely flawed. By the end of the book, Becky is almost unlikable. In this way she's a very good example of another truth in literature: well-written protagonists are well-rounded characters. In "Hamlet," the titular character is also the protagonist: he seeks revenge for his father's murder and takes action to find and punish the killer. Many literary arguments exist about who serves as Hamlet's antagonist: is it his uncle, the murderous Claudius, or is it Laertes, son of Polonius, who seeks revenge for his own father's death at Hamlet's hand? Some scholars even have argued that Hamlet himself is his own antagonist, i.e., his own worst enemy. Sometimes a character who appears to be a story's protagonist is abruptly removed from the plot. These characters are known as "false protagonists." They often appear in mysteries and are usually killed off at the beginning of the story. A false protagonist usually represents an author's deliberate attempt at deception. An example of a false protagonist in modern cinema is the character of Dallas in the 1979 sci-fi horror film "Alien." Played by actor Tom Skerritt, Dallas is captain of the doomed ship Nostromo, which is infested with a malicious alien creature. Once the alien is loose, however, Dallas is one of the first to be killed, and—spoiler alert—Ripley is the sole survivor. What Is Theme in Literature and Why Is It Important?